One lesson from the Zotero project has been the wild popularity and usefulness of video introductions or screencasts to help people understand and get started with a new piece of software. Text explanations and manuals just do don’t as good a job as showing software in action. 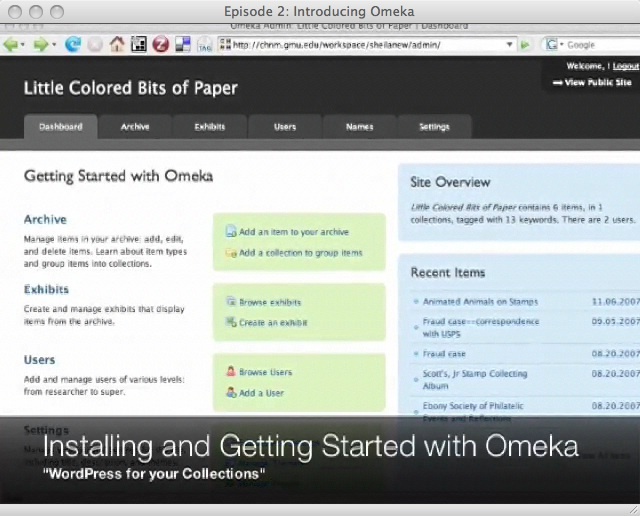 This month’s THAT Podcast from Jeremy Boggs and Dave Lester walks the viewer through the installation and customization of Omeka, which Jeremy and Dave work on, and which just launched recently. (And it’s off to a fantastic start, with active forums and nearly 300 downloads in under a week, a very large number for an institutional web app.) It also includes interviews with Tom Scheinfeldt and Sharon Leon, the directors of the project. The podcast is filmed in part in the Center for History and New Media‘s “Owl Lounge,” a favorite brainstorming site at the Center. And yes, Dave and Jeremy are already showing off some of the Omeka swag, including t-shirts and laptop stickers. The Omeka and Zotero teams are currently out in force at the packed Code4Lib 2008 conference in Portland, Oregon, where they will each be presenting and hacking.